I always enjoyed ordering taco salads, feeling like I was making a smart choice by getting a salad. But when you really stop and think about it, taco salads can be high in calories and low in nutrition. 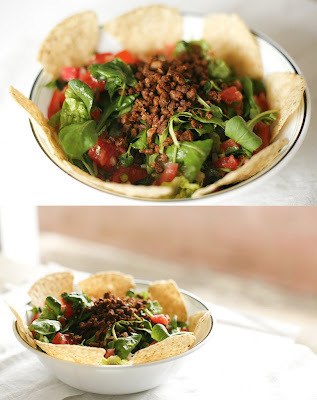 For the times I crave taco salads but I don't want to feel guilty, I created this recipe. 1. Add 1 Tb of olive oil to a medium sized pan and allow to heat for 20 seconds. 2. Add the ground crumbles and the taco seasoning. Mix well and cook for 5 minutes, stirring occasionally. 3. Serve in a medium sized bowl. Combine a equal amounts of romaine, baby arugula and baby spinach. Topped with ground crumbles, pico de gallo salsa, vegan cheddar cheese, and french dressing. Place tortilla chips around the bowl or serve in a separate plate.